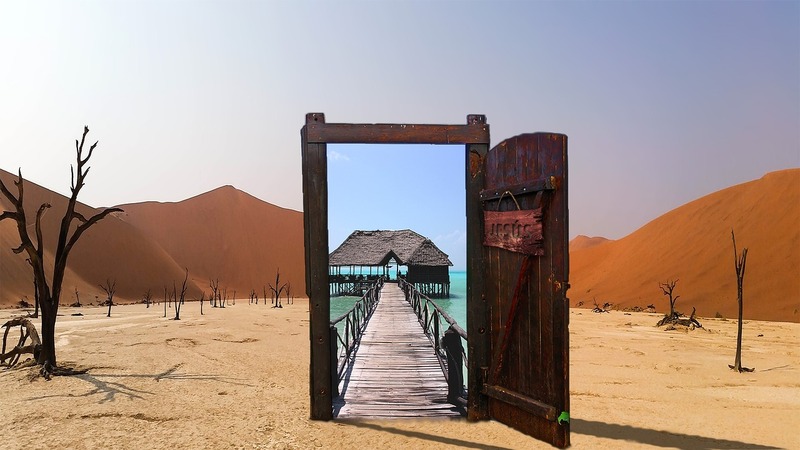 Recently, I listened to a short sermon about the importance of allowing God to close a door in your life so that He can lead you somewhere else. I’ve heard this preached my whole life, but on this particular day, it spoke to me in a new way. I knew the premise of the message was to let God have control, but my mind immediately recalled a problem that we had faced on a daily basis for several years and how frustrating doors can be. We recently sold our home and downsized. In our former house, there was a bathroom closet door that was behind the entry door to the room. To get anything out of that closet, we had to close the entry door slightly to make enough room open the closet door. It was frustrating at times, and sometimes the two door handles would become entwined creating a 10-minute ordeal to fix them both. At times, I would be in a hurry and need something out of that closet while my husband might need to pass through the door. We learned how to coordinate this process, but it was somewhat aggravating at times. Why didn’t God let that happen? It was perfect for me! Not getting what I wanted was bad enough but sometimes the sense of despair over not knowing where to go next would also creep into my thoughts. Soon, though, God would open a new door and show me blessings that I never imagined possible—many times giving me substantially more than I even knew to ask for in the first place. I’ve seen Him open doors that were “blocked” by the one I had clung to in the past. During my dating years, I had a few heartbreaks like most people. I remember thinking that I might not be able to endure it ever again and maybe I would never marry. The young men that I dated never seemed to work well with me, and no matter how hard I tried, each relationship would crumble and end in pain. When God brought my husband into my life, it was so evident that I had been wrong to ever worry about any of this part of my life. Tim was and still is so much more than I ever expected in a husband, and I was almost mad at myself for not trusting that God would lead me to such a perfect man for me. If I had only known what He had waiting for me, I might never have dated another boy. Are you holding on to the handle of a door? Are you pulling against a force that is trying to close a door for you? Are you tired, frustrated, exhausted from the struggle? Trust in Him. Let go of that doorknob and relax. He is closing that passage to keep you safe and He has great plans for you. He cannot wait to lead you on a better course. Trust the One who has your best interest at heart. There’s a new door somewhere close. It may be hidden behind the one you are fighting to keep open. Maybe it’s time to surrender to the One who has never left you or forsaken you. He loves you and wants the best for you. Relax, release, and rely on Him. This entry was posted in Blog Posts and tagged Does God Hear Prayer, God Closes door, God's Plan. Bookmark the permalink.